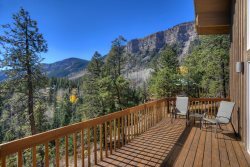 This great two bedroom 2 bath Purgatory Townhome is located at Durango Mountain Resort/Purgatory ski area. Just a short walk to the ski area, shopping and dining. Historic Downtown Durango is only a 25 minute drive away. Easy access to the San Juan scenic byway which takes you to Silverton and Ouray. Outdoor activities abound. The perfect vacation place any time of year. One bedroom has a king bed the other has 2 queens with balconies off of both bedrooms. Two full bathrooms with tub-shower combos. There is a wood fireplace in the living room and another balcony. Satellite TV and wireless internet. Marie was easy to work with. She provided great information on the property choices and was helpful in selecting the right one. Marie was very helpful.she answered the calls and texts very promptly. Everything was done via internet and very smoothly. We arrived very late, 1am, and everything was ready. They had lots of bedding and extra blankets. The grill in patio worked very good. Everything was in clean working condition. Lovely time The condo was roomy and clean and in a great location with accessible parking. We had a fabulous time and would definitely book this rental again! After booking I received instructions to the place and how to get in which really helped me feel confident that we wouldn't have any trouble no matter what time we got there. Didn't get there until after dark and in the rain and didn't have much trouble locating the place. The condo was clean and ready for us.